The origin of all Iris are the Species Iris that have been collected and hybridised over hundreds of years. With over 300 Species of Iris plants mainly from the cooler and temperate zones of the northern hemisphere some Iris species are true bulbs and others are rhizomes. Species Iris comprise of the 27 different groups of wild irises, most of which contain a number of separate species such as I. Pseudacorus, I. Virginica and I. Sibtosa. 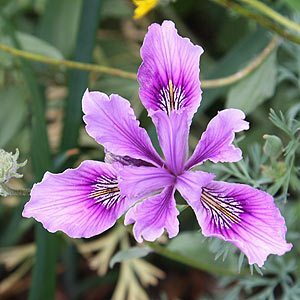 Iris douglasiana (pictured right) , is a North American Species from a group that have become widely known as ‘Pacific Coast Iris’ is a particularly lovely example of nature at work. So Iris is the genus and the species include bearded, beardless, bulbous (Xiphium and Junos), as well as reticulate. What we call Yellow Flag is the species, Iris pseudacorus. Modern Bearded Iris are from the species Iris germanica. And Dutch Iris or Iris x hollandica are actually a hybrid between two bulbous species, so they are really Iris tingitana x Iris xiphium. Iris histriodes and Iris reticulata are two of our favorite iris species and even within those two it is some of the cultivars that we do look the best. Iris histriodes x “Katharine Hodgkin” which is actually a cross between two species I. histrioides and I.winogradowii we think is beautiful.